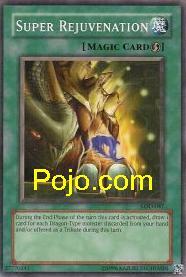 This card can work wonders in any Dragon deck or you can even get away with using it in an Exodia deck with DNA Surgery, which can really help this card by making any and all monsters on the field Dragons before tributing them for any reason. Also because it's Quickplay you can use it on your opponents turn when they use cards to make you discard like Delinquent Duo (as long as you have a dragon in your hand), so your never left empty handed. The best monsters to use this card with right now is Spirit Ryu followed by Grey Wing. This card is cumulative too, meaning if you play 2 or 3 in the same turn, you draw 2x or 3x the amount of discarded dragons, be careful not to deck yourself out though because once you activate it it's a mandatory effect, meaning you can't choose only to draw 2 cards if you discarded 3 dragons. The only real restriction to this card is it won't work from overflow discards at the end of your turn, and it cannot be activated during Damage Step, which doesn't matter because it's effect last for the turn so you can activate it before or after damage step. Spirit Ryu, Gray Wing, Jowgen (way too random though), Morphing Jar, Graceful Charity, Magic Jammer, Card Destruction, Tribute To The Doomed, Return Of The Doomed, Soul Exchange, Share The Pain, Final Destiny, Darkness Approaches, The Cheerful Coffin, Axe Of Despair (When Destroyed) and Burst Breath. Hino-Kagu-Tsuchi, White Magical Hats, Morphing Jar, Delinquent Duo ,Confiscation, Card Destruction, The Secret Of The Bandit, Smoke Grenade Of The Thief, Drop-Off, Robbin' Goblin and Forced Requisition works but is hardly played. Tribute two dragons to summon Tyrant Dragon or similar: draw 2 cards. Discard two dragons to Graceful Charity: draw 2 cards. Discard a dragon to Magic Jammer: draw 1 card. 1. If your hand size exceeds 6 at the end of your turn (forcing you to discard), this effect COULD theoretically be activated AFTER that discard... which means that you get to draw cards during your end phase, increasing your hand size to beyond six... so, would the rules force you to discard more cards, or would you get to keep the extra cards? Anyway, that little oddity of a situation notwithstanding, this card is too situational. You'd generally only use it if you had too many dragon-type monsters in your hand, discarded them using some card effect or other, and drew new cards. Granted, this will help thin your deck, but unless you're using this in a combo with Troop Dragon, it's not really going to work for you. Using magic or trap cards just to discard is a waste of cards unless you're using Graceful Charity. Graceful Charity + Super Rejuvenation: Discard 2 cards (4 including GC and SR) and draw 5. Pretty good trade. This combo is actually decent, but since GC is going to be restricted to one it'll get harder to pull off. Scapegoat + Cannon Soldier + DNA Surgery (Dragon) + Super Rejuvenation: Dang it, another 4-card combo.. fortunately Cannon Soldier can be replaced with Amazon Archer. So... this combo would do 2000 (or 2400) points of damage to your opponent AND let you draw four cards! And if you tribute Cannon Soldier you get to draw another card! Wow, this combo is actually good. Additionally, if it's pulled off correctly this card could actually have a really good combo with [Mirage of Nightmares] (coming out in PHG). Casual: 2.5/5 in a dragon deck, 0/5 elsewhere. 3.5 if DNA Surgery works. Tourney: 2/5 in a dragon deck, 0/5 elsewhere. 3/5 if DNA Surgery works. If it doesn't, Super Rejuvenation is too situational and it requires other cards just to work, and even more cards to make it better.